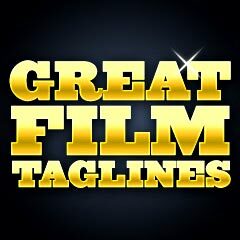 Great Film Taglines: Taglines (often called slogans) are catchy, enticing short phrases used by marketers and film studios to advertise and sell a movie (create "buzz"), and to sum up the plot, tone or themes of a film. Many films have multiple taglines. Composing ad copy for posters and trailers is generally the first step in marketing a film and setting a strategic direction for the product. These 'sound-bite' epigrams are often placed on either film posters (above or below the film's title) or on the merchandise itself (DVD or video cassette box, etc. ), to reinforce what the film is all about. Some films do not have a tagline at all, and instead choose to provide evocative images to convey the meaning, mood, symbolism, or setting of the film (i.e., Chinatown (1974)). Some taglines are quite obscure, unrecognizable and forgettable. Often, the best taglines are for very inferior films. And many times, a sequel's tagline will only add the word: "again" to the previous film's tagline, i.e., Poltergeist III (1988): "They're back...again!" or Candyman: Farewell to the Flesh (1995): "Dare you say his name 5 times...again" or Mission: Impossible II (2000): "Expect the impossible again." The # 1 Tagline: In 2008, according to www.taglineguru.com in its polling resulting in the Top 100 American Movie Taglines, Alien (1979) was at the pinnacle of their list: "In space, no one can hear you scream." The website based its results upon four criteria: suitability, creativity, originality, and memorability. Their top 10 are noted below with a "Top 10" icon. has selected as the 100 Greatest Films.